The 2016 paperback edition of the book by Paul Taylor and the Pew Research Center, updated with nearly 100 pages of new text and charts. The America of the near future will look nothing like the America of the recent past. America is in the throes of two simultaneous demographic overhauls. We’re enroute to becoming a majority non-white country at the same time a record share of us are going gray. As a result, generation gaps have opened up in our political and social values, our economic well-being, our family structures, our racial and ethnic identities, our gender norms, our religious affiliations, and our technology use. An incisive survey of vast recent changes in American society and the ever-wider generation gap between baby boomers and millennials…. In this well-written, data-rich book, Taylor…examines the demographic, economic, social, cultural and technological changes that are reshaping the nation…. An authoritative report and required reading for policymakers. These changes have created an America in which young and old don’t look, think or vote alike. We have one party that skews older, whiter, more religious and more conservative and the other that skews younger, more non-white, more liberal and more secular. There’s more animosity between partisans now than at any time in modern history. Some of it spills beyond politics into everyday life, influencing where people live, whom they befriend and how they search for news. But at the same time, a large share of Americans are turned off by the rancor of politics and the gridlock in Washington. Many wish their elected leaders would seek pragmatic compromises. However they are less likely to vote, and most lack the temperament and vocal cords to attract attention in today’s media culture. They might be seen as America’s new silent majority. As a new presidential campaign navigates these turbulent waters, long term challenges mount. Today’s Millennials – well-educated, tech savvy, and underemployed – are at risk of becoming the first generation in American history to have a lower standard of living than their parents. Meantime, about 10,000 Baby Boomers are retiring every single day, many of them not as well prepared financially as they’d hoped. The graying of our population will put stresses on our social safety net and present our elected leaders with a daunting challenge: how to keep faith with the old without bankrupting the young. Drawing on Pew Research Center’s extensive archive of public opinion surveys and demographic data, The Next America is a rich portrait of where we are as a nation and where we’re headed – toward a future marked by the most striking social, racial, and economic shifts the country has seen in more than a century. The 2016 edition includes a new introductory chapter, as well as a new appendix that explains how we conduct public opinion surveys at a time when new technologies and declining response rates have presented our profession with a mix of new challenges and opportunities. 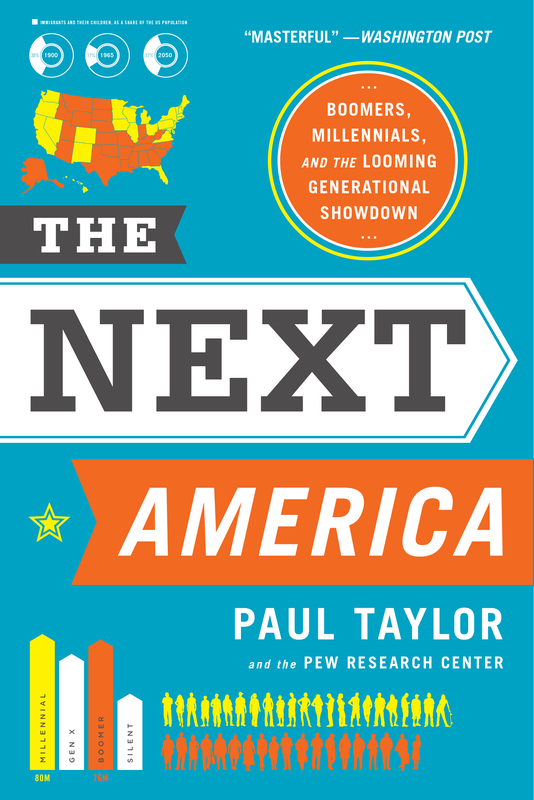 Paul Taylor is the author of The Next America. He served as executive vice president of the Pew Research Center and is a former politics reporter at the Washington Post, as well as the author of See How They Run and co-author of The Old News Versus the New News.